If your computer is loading and you have an internet connection, we can usually help fix your issue remotely using secured remote support software usually on the same day. If you are near one of our service centres in North Lakes, Calamvale or Ipswich, you can usually drop a machine off to us. This can be a cheaper alternative if there are tests that need to be done as we usually cap it at around the 3 hour mark. We sometimes can service machines the same day if you choose to drop it off to us. Our hourly rate of $110 is highly competitive and we don’t charge a call out fee unlike most other companies. Usually if your computer is not loading or there is an internet problem or a hardware problem and you have a fair idea what it is without alot of diagnostics being done with it, this is your way to go! Laptop Screen Smashed or a nothing on screen? Apple Mac Book or iMac not turning on? Keyboard Not working / keys Missing? Laptop is not powering on? To fill out a form to get a quote directly online. Computer Slow or Have Viruses? North Lakes Computer Repairs is your local provider of high quality yet affordable computer maintenance. We have over 10 years of experience in PC and Apple Mac repairs. Our team of experienced Microsoft Certified professionals and savvy ex-Apple employees has impeccable knowledge and expertise that are always dedicated to solving any kinds of technical issues in PCs and Apple Mac computers. Our mission is to provide fast, reliable and affordable solutions for all your computer problems. Over the last decade we have gained lots of loyal and satisfied clients, who trust us with computer repairs and maintenance. You can become one of them by getting in touch with us! being interviewed on Channel 9 news about speeding up your computer/Internet. Own a small Business and Need Business Solutions such as your own email or website? We now design websites and Logos at a fraction of the cost that the larger companies charge! We also host your website on Australian Servers, other companies usually put your email and websites on servers located in other countries which can affect performance and reliability! Do you also need your business to appear on Google? We do search engine optimisation (SEO) which is how you found us to promote your business to get you extra work. Call and speak to the manager Robert. We love fixing computers - no matter what brand or type of computer you have we can help. We are a family based business and have technicians all around the greater Brisbane area from North Lakes, Brisbane, Ipswich and Logan. Give us a call for any questions about any questions that you have. We love fixing apple products from Mac Book Air's to iMacs. Even if apple turn you away, give us a call as usually we can fix system boards as well, as opposed to you buying a new computer. The only thing we don't fix are iPhones and iPads. 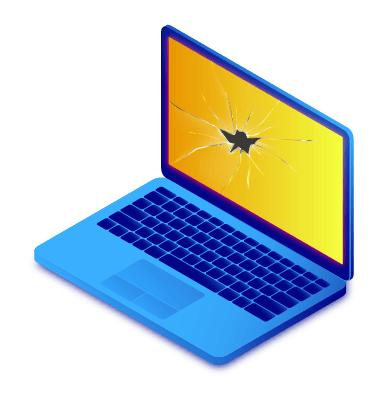 Whether it's a smashed screen or you've spilt that evening wine all over your keyboard we can assist in finding the best way to get you up and running in no time along with our competitive prices for all your laptop hardware needs. We know there's no worse feeling than when you think you've lost your data. Give us a call - we're determined to help you recover it! Computer running slow? Let us give it a good tune-up and it'll be fatser than ever before. We can assist with transferring you over to the NBN as well as the best plans to choose from. Sometimes the bigger companies such as Telstra, Optus, Iprimus are not the best ones to choose! Motherboard fried? We'll replace it. Faulty RAM slowing your PC down? We'll upgrade it. You can't scare the Geeks - they literally do it all! If you are a business owner that wants to be found on google, we can help. Let us help you soar through the ranks! Starting up a new business and want either a Logo or a business card done? Speak to us today and let us create one just for you! Already have a website but unhappy with parts of it. We can change or update your website with the latest content or changes you request. We host our websites in Australia - not overseas. Any issues you speak to an Australian not overseas. 24x7 support. Do you want your own domain name or a custom email address so you can appear more professional. We can help! We do as well. Windows 10 is designed for touch screens not people who have a keyboard and mouse - let us help to customise windows to make it more user friendly to the old Windows 7 such as bringing back the old start menu. We sell all software at a reduced rates where possible. Including Microsoft office 2010, 2013, 2016 as well as the latest windows 10 and everybody's favorite Windows 7 so that you don't have problems with those forced updates. Every hard drive will fail. It is just a matter of time. Let us direct you to the best cloud storage solutions for you so that you will never loose your precious documents, photos or Data. If your wanting solutions for the two above products let us know we can set you up and configure all your accounts and zone editor settings. If you don't want us to build you a computer and need a laptop as you want it to be portable we can offer a buying service for you or just give you general advice on the best laptop / specs based on your needs. Do you have a server that you are having problems with or is running slow or needs an upgrade? We can assist small businesses with getting their server up and running again in the quickest time to prevent business impact. 9 times out of 10 you can prevent something from happening to your computer by having regular check ups and maintenance. There are several things we can look for that can usually take an hour to ensure that your not going to run into a catastrophe anytime soon! Are you having trouble determining what phone you should buy or what tablet you should get? Do you need advice on what internet provider has the best plans available. We are happy to give non biased advice for these type's of questions you may have. Finally you have a friend in the business! In some cases we can actually call up your ISP and get a better price for you because we are aware of what other ISP companies are charging and can save you $$$ of your bill per month or a higher data rate. While we are not a financial advisor a lot of people Are wondering how they can buy and get started with bitcoin, etherium and other alt coins. We can assist with the technical know how to do this as well. Assisting with Entry into and out of fiat and sending to exchanges. We'll help you setup your new computer and transfer any old file across. We can also bring the start button back to windows 8. Your computer has started to run slowly? Or constantly freezing and crashing? Most likely, this means that the time for that tune up has come. If you have problems with your broadband internet, wireless or wired network or simply need assistance setting up a new broadband installation or network, we can help. Upgrade your computer hardware for increased performance. A memory upgrade and harddrive upgrade begins a huge performance boost. We provide a wide range of professional maintenance services for all kinds of Apple Mac computers and laptops. We work with Macs regardless of their model, generation and release year. It is important to have a safe and functional email account that you can rely on for your personal or business needs. Deleted a file by accident or migrating to a new machine. We can recover data from most computers and devices including iPods, iPhones, Hard Drives & memory cards..
We'll clean your computer from those internet nasties that spy on your personal data and cause havoc with our system. I would definitely recommend this business. It was so easy as I was able to be at home and the repair was done remotely . It was all very calm and professional and no fuss. Many thanks. Robert is great !. He arrived the same day and troubleshot my problems and had my 2 laptops and two mobiles purring along in no time. Brilliant stuff and nice guy too. Robert was professional and very helpful. He only charged 1 hour and worked on my computer for 2 hours. He has taken all my stress away and I highly recommend him. I will be always using him from now on.Thank you heaps, Robert. North Lakes Computer Repairs is at your service every day from 07:00 AM to 10:00 PM, including public holidays. We offer computer repairs and services from desktops, laptops and Apple Macs, ranging from hardware and software installations to malware removal. You can find an extensive list of our services here. Yes, we sell Microsoft products such as Windows and the Microsoft Office Suite, as well as antivirus and other essential software. We can recommend you different software products depending on your needs and install it for you. Do you sell brand new computers? Yes, we can offer you custom built computers depending on your needs at an affordable price. Do you sell replacement parts for computers? Yes, we provide replacement and upgrade parts for most brands of laptops and desktops, as well as for Apple Macs. Do you accept cash or credit card payment? What banks do you support? Yes, we accept cash payments, debit and credit card payments and all sorts of bank transfers. We try to cater to all your computer service needs. In case you’re experiencing an issue that we cannot deal with, we will refer you to an appropriate specialist. How long does it take for your computer technician to arrive to fix my computer? It depends on the availability, but usually we send a technician to you on the same day. It usually depends on the scale of the repair. We always try to complete all repair in the same day, but more complicated procedures can be completed overnight. Please note, that we always prioritize out business clients’ needs, since their business operations very often can depend on how quickly their computer problems are solved. How do I make sure that my data stays safe? 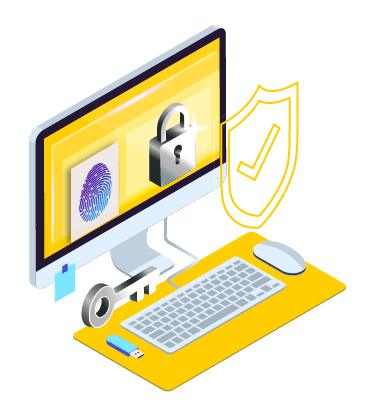 We always handle your personal data with care and make sure it stays secure. For extra security, we recommend that you back your data up before having any repairs done on your computer. Do you offer service guarantees? We require a minimum pay of A$110 which includes diagnostics. We will always do anything in our power to solve any computer problems, even if it takes more time and resources. What happens if my computer can’t be fixed on site? Sometimes we have to hold onto your computer overnight in order to run all the necessary diagnostics, reinstall the operating system and the software in order to ensure that your computer is fully functional once you come to pick it up.